Once a high profile seat represented by Congress stalwart ND Tiwari, the Nainital-Udham Singh Nagar parliamentary constituency in Kumaon will this time witness the state president of the Bhartiya Janata Party, Bachi Singh Rawat, contesting against the sitting Congress MP KC Singh Baba. The Bharatiya Janata Party leaders today dared the Congress to have an open debate on their respective election manifestos. While terming the Congress manifesto as nothing but an attempt to appease minority communities, co-incharge of BJP affairs in Uttarakhand Dr Anil Jain castigated the Congress for promising reservation on the basis of religion. After a gap of 22 days, Chief Minister Maj Gen BC Khanduri (retd), the star campaigner for Bharatiya Janata Party (BJP) in the state, has rejoined the poll battle. Khanduri had to leave the campaign in March following health problems. He was diagnosed with gall bladder stones and was operated upon at Apollo hospital in New Delhi in the last week of March. Dehradun has a huge potential to generate quality player in chess as the youngsters here are much inclined towards the game of chess. The social welfare department has identified as many as 32,750 girls from economically weak families, with the help of census surveys. The department came up with the Nanda Devi Kanya Yojna (NDKY) to remove the stigma of a girl child being a financial liability for her parents. Dare Devil and Rising Star won their matches at the ongoing Kalanga Cricket Tournament at Tapovan here today. The director of Uttaranchal Ayurvedic College Dr A K Kamboj said more and more patients are turning towards ayurveda for curing their ailments as it has no side effects. The Tata car dealer showroom at Indira Industrial area Haridwar today showcased Nano for the first time in the city. Nano was the cynosure of all eyes as people waited outside the showroom to open. The potential buyers were seen filling booking forms instantly after taking a test drive. MD Rajeev Mitra of IS Motors said the initial response was overwhelming and people turned up to the showroom in numbers and enquired on phone too about the cost and other aspects of the car. Dehradun's Ex-Servicemen League has demanded implementation of the Kerala High court order passed in 1987, which calls for the Ministry of Defence (MOD) to increase the basic pay of defence officials that was earlier reduced by the ministry during implementation of the 4th Pay Commission. As part of the 28th annual celebrations, All-India Conference of Intellectuals (AICOI) had provided intellectuals honour- 2009 with as many as 13 personalities being bestowed with Uttarakhand Ratan, here today. Prakash Nidhi Sharma of AICOI said the association has been honouring people, from past many years, who have done commendable works in the state. Congress leaders had to face an embarrassing situation today when the Pithoragarh administration refused landing permission to their chopper due to technical reasons. Lord Macaulay wanted to introduce Western education and culture on Indians forcefully but it was Swami Shraddhanad who introduced Gurukul educational system to counter Macaulay’s education with emphasis on strengthening the Indian moral-education system, said Swatantra Kumar, Vice Chancellor of Gurukul Kangri University. 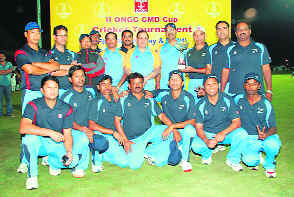 Assam Aragons defeated Doon Dynamos by three wickets to win the second ONGC CMD Cup Cricket Tournament at the Abhimanyu Cricket Academy grounds. Long standing demand for extending the territory of Corbett Tiger Reserve came up for discussions with Union Cabinet Secretary KM Chandrasekar as Uttarakhand Wildife officials put forward their concerns before the secretary. The forest guards of the Rajaji National Park, Bereewara range, encountered few miscreants while they were hunting two cheetals. However, the miscreants managed to flee from the spot after being spotted by the gaurds leaving behind the bodies of the cheetals. 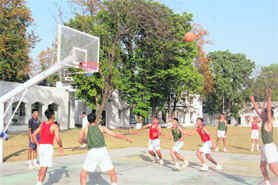 On the third day of the Inter-Section Basketball Competition at RIMC here today, three matches were held. Ranjit Section took on Chandragupta Section in all three divisions - junior, middle and senior. Hemant Sharma lifted the 1st Uttarakhand Open Chess Championship trophy in the seniors category at Doon Sports Academy, here today. After a train to Chandigarh from Dehradun, a train connecting Haridwar to Fazilka is on the cards. Although Narain Singh Jantwal of Uttarakhand Kranti Dal is also contesting, but according to political experts, it will mainly be a bi-polar contest between Congress and BJP candidates. The constituency has more or less been a fiefdom of Congress, barring a few elections when the party has lost. But this time, Congress seems to be in a tight spot, as BJP has fielded Bachi Singh Rawat, a four-time MP from Almora, who shifted to Nainital-Udham Singh Nagar after Almora constituency got reserved in the delimitation. Apart from being a favourite tourist destination, Nainital symbolises a truly national character with people from different parts of the country and religions living in harmony with each other. Choosing to be different from the rest of the four Lok Sabha seats of the hill state, the people of Nainital had always voted for development. This time, as many as 12,42,383 voters will be deciding the fate of the candidates in fray. According to records, the Congress has registered a victory from Nainital-Udham Singh Nagar eight times since 1951. While BJP won this seat two times, other political parties had managed three victories. Congress stalwarts like KC Pant and ND Tiwari had represented this seat in the past. In 1991, BJP won this seat for the first time and its candidate Balraj Passi caused a major upset by defeating Tiwari. However, Tiwari bounced back and won this seat in 1996, contesting as Tiwari Congress candidate. Two years later, BJP once again struck back, winning the seat in 1998. It was Congress stalwart KC Pant's wife Ila Pant, who contested on a BJP ticket, and defeated Tiwari. In 2002, Tiwari became the Chief Minister and it was KC Singh Baba, a Congress candidate, who emerged victorious. However, about the performance of Baba as MP, the general sentiment among the masses is that he took little interest in development of the constituency. Another major thing, which can go against the sitting MP, is his "inaccessibility". A major section of the people complain that Baba was difficult to reach. The BJP on the other hand seems confident with its party president Bachi Singh Rawat trying his luck from this seat. Rawat had won four consecutive parliamentary elections from Almora constituency. However, after delimitation Almora became reserve, following which Rawat has shifted to Nainital-Udham Singh Nagar. According to experts, Rawat's accessibility, his down-to-earth approach and successful electoral career makes him a very strong candidate. Another factor that goes in BJP's favour is the considerable number of Sikh community votes in Udham Singh Nagar. Harbhajan Singh Cheema of BJP is already MLA from Kashipur in Udham Singh Nagar district. Furthermore, after the delimitation, the Nainital-Udham Singh Nagar parliamentary constituency has lost Ramnagar to Pauri. The development is likely to hurt the Congress interest, as the area has a big chunk of voters from the minority community. The assembly segments that fall in this parliamentary constituency now include Lalkuwa, Bhimtal, Nainital (SC), Haldwani, Kaladhungi, Jaspur, Kashipur, Bajpur (SC), Gadarpur, Rudrapur, Kichha, Sitarganj, Nanak Matta (SC) and Khatima. “It is shameful that to garner votes of the minority communities, the Congress is advocating reservation on the basis of religion,” he said. While showering praises on the manifesto of BJP, Jain alleged that UPA has proven to be the “worst” government in the history of the country. “Whether it was the issue of terrorism, inflation or development, the UPA government has failed on all fronts,” he alleged. He said if voted to power, their government would ensure that “black money”, amounting to a minimum of Rs 25 lakh crore lying in Swiss Bank, is brought back to the country. “We strongly feel that if any political parties opposes this move, it will mean that they have vested interests,” said Jain, adding that BJP has come up with an opinion poll kind of questionnaire for feedback of people on this crucial issue. Activists of Bhartiya Janata Yuva Morcha would be getting these questionnaires filled from people across the state. Jain said the state unit of the party would also release a chart of the comparative performance of the five-year rule of Congress and two years of the Khanduri government. “Likewise, we will be releasing a document regarding the works done by NDA and the UPA governments in Uttarakhand. We will highlight the step-motherly treatment meted out to the state by UPA,” said Jain. Meanwhile, Jain informed that BJP state general secretary Ajay Bhatt and Tirath Singh Rawat have been appointed incharge of the party’s campaign in Almora and Pauri parliamentary constituencies, respectively. “The State Election Campaign Committee chairman Manoharkant Dhyani will focus on Haridwar constituency and committee vice-chairman Balraj will take care of Nainital,” he disclosed. Having recovered since then, Khanduri today went to Srinagar Garhwal and addressed three conventions of youths, women and ex-servicemen, respectively, at Rudraprayag and Srinagar Garhwal. He claimed that it was only the BJP that has been looking after interests of the entire society besides carrying out developmental activities. It was his government that reserved 50 per cent seats for women in the panchayats, he said. To ex-servicemen, his core constituency, Khanduri reminded that it was the BJP only that has cared for their welfare. “It was the NDA government led by Prime Minister Atal Bihari Vajpayee that decided to send the coffins of Kargil martyrs to their homes. The Congress government has even failed to redress the pay anomalies of Army personnel,” he said. Earlier, Khanduri had taken a headstart in the campaign much before imposition of the model code of conduct and extensively toured the state. But due to his illness, the BJP campaign had lost some momentum and individual candidates were fending for themselves, with Central party leaders busy electioneering in places where polling would be held in earlier phases. The participations from the region are usually very high at various chess championships. D K Chopra, who had won an International Open Lightening Chess Championship Singapore from the year 1986 to 1989, said Dehradun has the potential of generating international chess players but the game needs to find a sponsor. Chopra was in town to witness the 1st Uttarakhand Open Chess Tournament. “When I started playing chess, it was more of an ignored game than what it is today. Parents are today encouraging their children to take up the game. “Chess has evolved itself as a game that is played at the psychological level. It improves power and determination and also keep one focused,” added Chopra. Speaking about the infrastructure, he said the city has good facilities for holding big tournaments. But it all comes to finding a good sponsor. “Some players participate for prize money, some to improve their ratings and some take the game as a pass time. Important thing is to generate competition and to make quality players come to the tournament that raises the level of the game. All this all boils to sponsorship issue,” he said. He, however, added that the sponsorship was to improve the standard of the game in the town. Col KK Pandey from Air Force, who has also participated in many national and international tournaments, said it is a good beginning to the tournament with players from South, Delhi, Chandigarh, Punjab and other places who have been regularly participating in the game in the region. But it needs to be taken to the next level, where good higher-level players from all over the country should come. “Every tournament has its own individual importance so dose this tournament and the locals here have shown great interest in the game,” said Pandey. Another international level player Simranjeet Kaur who is just 12 years old and had participated at many international level competitions said, “It was a good experience to play in here and the exposure was equally good. “The atmosphere for the game was good too.” Simranjeet started playing chess two year back. She looks forward to participate again next year in the tournament here. The secretary social welfare, Manisha Pawar said that a fixed deposit of Rs 5,000 should be given to every family living below poverty line (BPL) on the birth of a girl child up to a maximum of two daughters. The deposits will mature only after the girl turns 18 years and clears the High School exam. Besides the scheme has an in-built provision for preventing child marriage. “The girl, in whose name the FD is made, has to remain unmarried till she turns the age of 18 years to be eligible to get the matured value of the fixed deposit,” said an official. To ensure safe delivery practice, the welfare department has also incorporated a condition that only those girls born in state government hospitals or medical centers under the supervision of trained health workers shall be eligible for the scheme. The scheme is open to BPL families blessed with baby girls this year. The families are required to produce a BPL certificate prepared by block development officials. The number of listed BPL families in the state stood at over 6,23,790 till January this year. The most number of BPL families in the state are in Haridwar district that has 92,430 of them. Udhamsingh Nagar follows with 70,517, Tehri Garhwal has 62,308, Almora has 60,659 and Dehradun has 55,199. In the first match played between Nanoorkheda XI and Dare Devil, Dare Devil won the match by five wickets. Batting first, Nanoorkheda XI went on to score 73 runs in 12.5 overs. It was a bad start for the team as they lost an opener on the second ball of the innings without a score on the board. First-down batsman Nitin was the top scorer with 25 runs off 20 balls hitting three fours and one six. No other batsman occupied the crease for long and the whole team could only manage to score 73 runs. For Dare Devil, Atul and Arun were the leading wicket takers. Atul took four wickets and Arun picked up three wickets. Naveen took two wickets. Chasing the target of 74 runs, Dare Devil reached the target with five wickets in hand. The openers paved the way for Dare Devil’s victory. Nikku scored 17 runs and Naveen made 31 runs off 29 balls. For Nanoorkheda XI, Nitin and Rahul took two wickets each. In the second match, Rising Star defeated Ninja XI team by 39 runs. Batting first, Rising Star piled up a total of 153 runs off 15 overs. For the opening wicket stand, Rahul and Ajay contributed 45 runs in the first four overs. Rahul was the top scorer for their team. He smashed 42 runs off 22 balls. First-down batsman Anubhav made 39 runs off 26 runs. For Ninja XI team, Lara was the pick of the bowlers taking four wickets in his two-overs spell. Rahul and Rakesh took two wickets each. In reply, Ninja XI were all out for 87 runs in 14 overs. For Ninja XI, Babbu made 28 runs off 18 balls. For Rising Star, Ajay took five wickets in his three-over spell. Ali took three wickets in three overs. Addressing a press conference here today, Dr Kamboj said ayurveda has a sure cure against several diseases. “At our hospital patients suffering from ailments like psoriasis, rheumatism, piles and even alzheimer’s disease have been responded positively to Panchakarma treatment,” he said. Kamboj said there is a misconception among people that the medicines used by ayurvedic doctors do not confirm to established standards but that is not the case. “All the medicines being used and sold in the market as per standards and the misconceptions are unfounded,” said Dr Kamboj. While Dr Arvind Chaudhury, senior physician said several complex diseases can be treated through ayurveda, which is also gaining popularity in abroad. “We had recently treated a German patient who was suffering from acute rheumatism. There was a considerable improvement in her health after the Panchakarma treatment given to her,” Dr Chaudhury said. He said at the ayurvedic hospital, modern diagnostic techniques such as X-ray and other pathological tests are also conducted to help in the diagnosis of the disease. On the other hand, Dr Y S Malik, senior superintendent of the hospital said good health could be achieved through the practice of ayurveda. He added that the hospital is providing cheap and quality health care at a minimum cost. 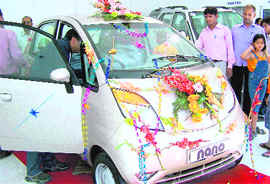 The Tata car dealer showroom at Indira Industrial area Haridwar today showcased Nano for the first time in the city. Nano was the cynosure of all eyes as people waited outside the showroom to open. The potential buyers were seen filling booking forms instantly after taking a test drive. MD Rajeev Mitra of IS Motors said the initial response was overwhelming and people turned up to the showroom in numbers and enquired on phone too about the cost and other aspects of the car. The base model is available at Rs 95, 000 cash payment while middle model is for Rs 1,50,000 while luxury is priced at 1,82,000 with finance service available. Sales sources said about 250 booking forms have been sold and more than 50 have submitted the initial amount. Middle class and lower middle class were seen at the booking counters while villagers and lower middle class were also seen enquiring at the showroom. Barring few most of the public was satisfied with features, looks and material used in the small wonder. “This is too small and shape of the car itself suggests scarcity of open space. This car is not meant for a big family,” said Latika Arora a BAMS student. Addressing a press conference here today, Brig KG Behl (retd), president of the League, alleged that the MOD was acting in violation of the court ruling and also of Article 14 of the Constitution. He said even the 5th Pay Commission recommendations for the defence forces, including 30% disability pay, weightage of two to three years for services from 30 to 33 years, using only rank instead of rank/post reducing pension of those who were serving in higher posts etc, were not received yet. The rank pay sanctioned by the 4th pay panel got doubled during in the 5th pay panel recommendations, which resulted in double loss as the basic pay was reduced further. "Taking into account our protest, the MOD tried to increase Grade Pay, but did not deal with the actual matter. “Therefore, we demand that the rectification in basic pay should be made as soon as possible," said Behl. As part of the 28th annual celebrations, All-India Conference of Intellectuals (AICOI) had provided intellectuals honour- 2009 with as many as 13 personalities being bestowed with Uttarakhand Ratan, here today. Prakash Nidhi Sharma of AICOI said the association has been honouring people, from past many years, who have done commendable works in the state. He said the association this year has bestowed Uttarakhand Ratan awards 2009 to Uttarakhand chief secreaty Indu Kumar Pande, VC Gobind Ballabh Pant University, Dr BS Bisht, commissioner income tax, RK Sharma, Vice Chancellor Doon University Girijesh Pant, Threesh Kapoor Chairman Uttaranchal Grameen Bank, Bhagwati Prasad Nautiyal Director Horticulture Raniketh, Vijay Raghav Pant Director Vigilance, Dr Pradeep Adlakha doctor, Suchit Narang Renowed musician, Ram K Gupta, Pradeep Nagalia and Jaya Gupta. Association also honoured master Aman Rehaman with Young Animator of Uttarakhand award. According to information, senior Congress leaders, including Uttarakhand Pradesh Congress Committee president Yashpal Arya and Congress candidate from Haridwar Harish Rawat were on a visit to various parts of the state for campaigning. Due to the snag, the Congress leaders could not attend the election rally and had to fly back to Haridwar. However, they confirmed that permission for landing was denied due to technical reasons. Dehradun: Uttarakhand Congress spokesperson Hemant Tyagi died in a road accident in Varanasi on Sunday. According to information, Tyagi had gone there to attend some election programmes of Congress leader and coincharge of the party affairs in Uttarakhand Bhola Pandey, who is in election fray from Gonda (Uttar Pradesh). Swatantra Kumar gave these remarks at the inauguration of the three-day annual function of the University. The function started with havan-puja amidst chanting of Vedic mantras which was followed by the flag hoisting ceremony at the Gurukul premises. Punjab’s famous bhajan recital singer Jagat Ram Verma presented bhakti songs at the function. 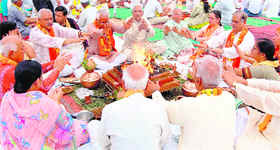 A 51-kund yagya will continue for next two days. Various various programmes were held in the evening, in which students took part in numbers. Presented at the function were registrar prof. AK Chopra, prof. Mahavir Aggarwal, BD Joshi, Manu Dev Bandhu, DK Maheswari, RD Kaushik, Senator Devraj Arya, Rajendra Aggarwal, Sangeeta Vidhyalankar, Dr Pradeep Kumar Joshi, US Bisht, KS Dagar, Mahendra Negi, Dr Dharampal among others. RS Sharma, CMD, presented the CMD Cup to Assam Aragons at a glittering prize distribution ceremony. He also distributed individual awards to members of the winning team and the special performance awards of the tournament. Batting first, Doon Dynamos were all out for 130 runs in 20 overs. The top scorers were Ajit (24), S Bisht (19) and Sanjay Bhatt (18). Bowling for Assam Aragons, JB Patel took four wickets and Pavitra Dutta took three wickets. In reply, Assam Aragons reached the target for the loss of seven wickets in 19.2 overs. PK Dutta scored 65 runs not out and CS Rabha scored 13 runs. For Doon Dynamos, Taj Rashid took three wickets. Prizes to the runners-up were given by BC Nayak, ED (Security). Tauqir Hussain, GGM-Chief HRD gave away gifts to the officials. PK Dutta of Assam Aragons was declared Man of the Match and Man of the Series. Sanjay Bhatt of Doon Dynamos was declared Best Batsman of the Tournament and Sudhir Bisht of Doon Dynamos was declared Best Bowler of the Tournament. With rising incidents of territory struggle between tigers, there has been a demand to increase the area of Corbett in the recent times. Uttarakhand authorities have suggested for inclusion of areas of Lansdowne and Ramanagar forest divisions in Corbett to increase its territorial limits. He also lauded state government’s initiative towards protection and enrichment of wildlife in the state. He also assured all assistance from Centre towards enriching Corbett wildlife. Uttarakhand chief secretary IK Pandey, chief wildlife warden Srikant Chandola and other senior state forest officials attended the meeting. The Union Cabinet Secretary was on a two-day visit to Corbett Tiger Reserve. Forest guards came across certain number of miscreants, who had killed two cheetals inside the park near Aurangabad village road. The officials also seized live cartridges and an axe from the spot of crime. Meanwhile, park warden IA Siddiqui said the forest guards were probing the matter and hoped for early arrests of the miscreants. In the juniors, Ranjit defeated Chandragupta 18-8. 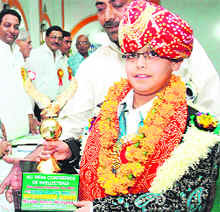 The highest scorer was cadet Ankit Singh of the Ranjit Section. In the middle division, Chandragupta levelled the score by defeating Ranjit 28-25. The highest scorer was cadet Suhas and cadet Ayush Salaria from Chandragupta. In the senior division, Chandragupta defeated Ranjit 23-16. The highest scorer was cadet Rahul Kadian. The next round of matches will be played tomorrow between the Ranjit Section and the Shivaji Section. Dignitaries present were Col H Dharmarajan, Lt Col Rajesh Nathawat, CS Vishwakarma and PK Sharma. According to Northern Railway sources, the train that will run between Fazilka in Punjab and Haridwar will take the Ferozpur-Ludhiana-Haridwar route, thus connecting several key cities of Punjab with Uttarakhand. The Dehradun-Chandigarh train had been started on April 1 for a period of 3 months. Taking into account the volume of traffic, there is high possibility of extension of the period.